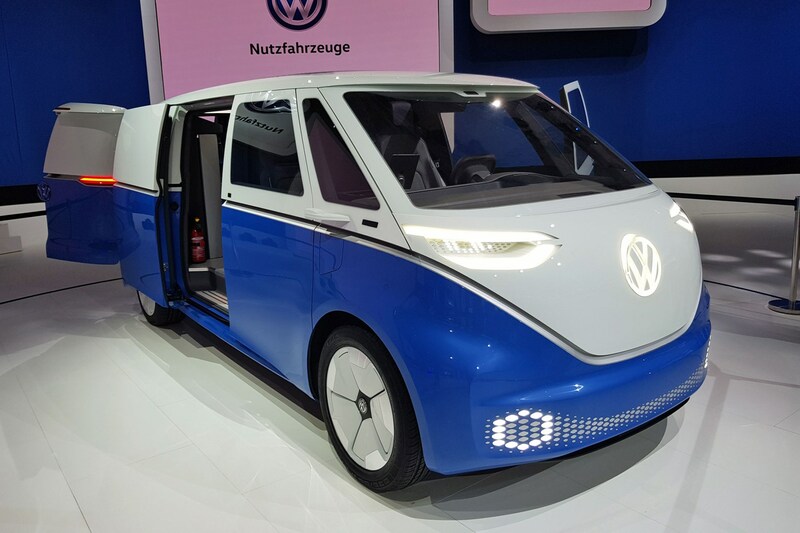 If the Volkswagen ID Buzz Cargo isn’t the cutest concept at the 2018 IAA Commercial Vehicles show, we’ll eat our press pass – although since we could probably drown that in the copious amounts of currywurst sauce VW is also serving up on its exhibition stand that probably wouldn’t be a hardship. We digress. The ID Buzz Cargo. 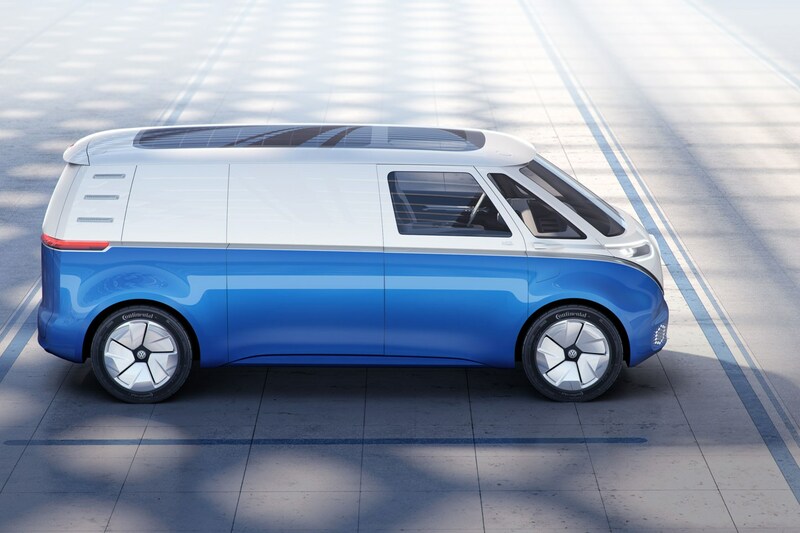 As the name suggests, it’s a van variant of the 2017 VW ID Buzz passenger vehicle, and one of five world debuts from Volkswagen at the 2018 IAA. 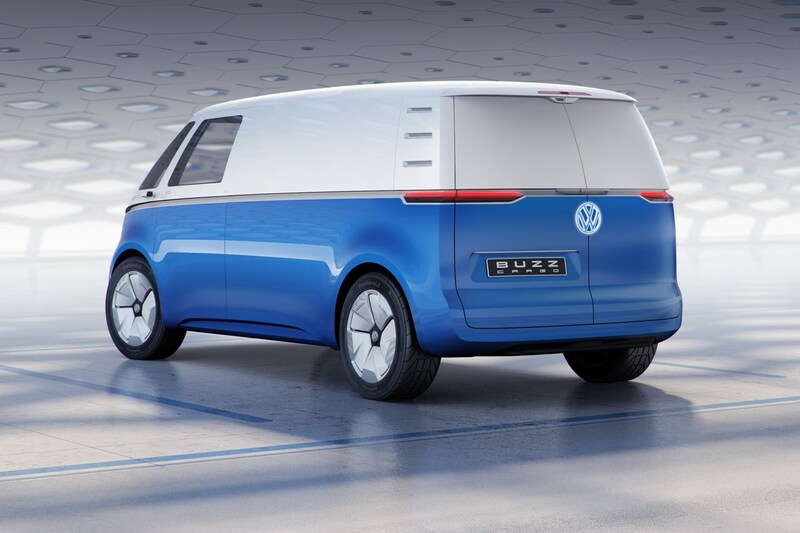 Instantly recognisable as a retro-modern interpretation of classic VW van styling cues, the ID Buzz Cargo is a posterchild for Volkswagen’s future electrification plans that also touches on autonomous driving technology and the potential advantages of an internet-connected load space. What’s more, VW is actually planning to build it. Not at all – although it does make us chuckle every time VW describes the ID Buzz as a ‘progressive’ design. VW is already talking about a production version, as ‘supplementary’ model to the Transporter range rather than a replacement. 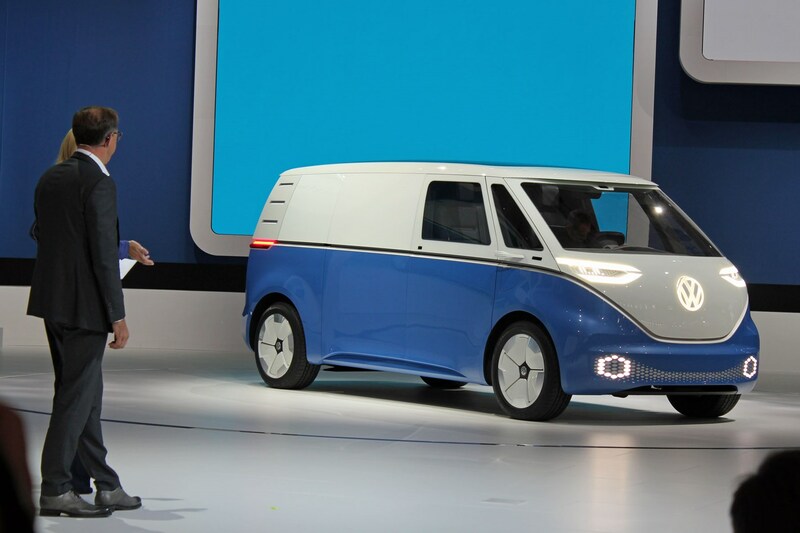 So while VW is entirely serious about this, we probably aren’t looking at the Transporter T7 here. 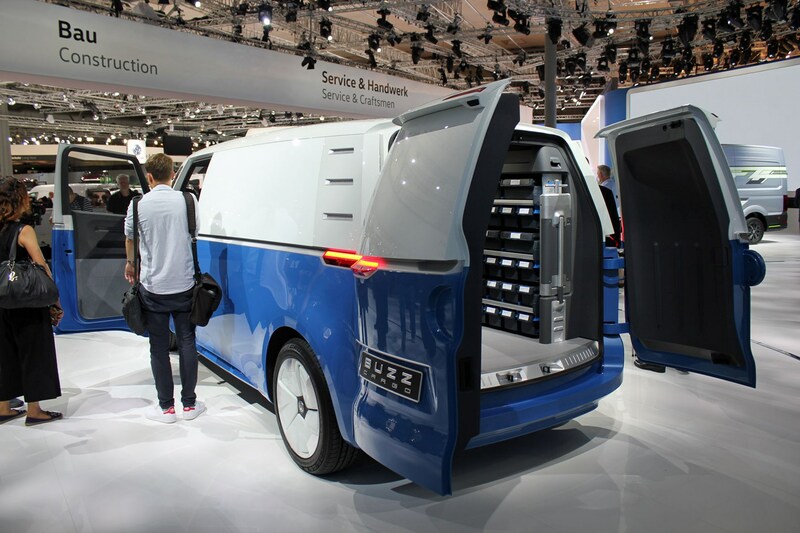 Approximately the same size as the current T6-generation VW Transporter, but based on Volkswagen’s brand new MEB modular electric vehicle platform, the Buzz Cargo combines its cute looks with ‘remarkably good space’ (lots of load area, basically – it’s longer than the passenger version) and a zero emission driving range of up to 340 miles (550km). 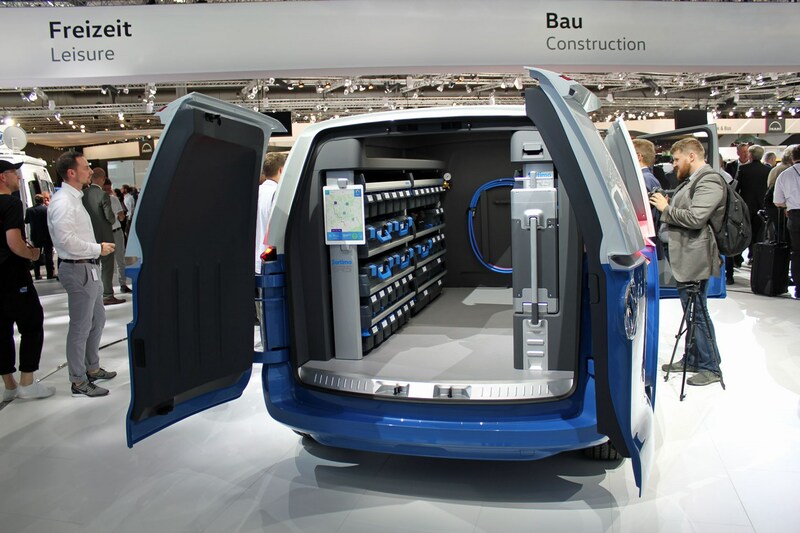 Variable battery pack options mean you can choose to sacrifice some of this driving range for additional payload, with around 205 miles (330km) being the predicted minimum; still be very impressive by current electric van standards. Those range predictions are based on the latest WLTP testing standards, too. The smaller battery setup (48kWh) can be charged to 80% capacity in just 15 minutes, while the expanded (111kWh) option requires 30 minutes to achieve the same state. 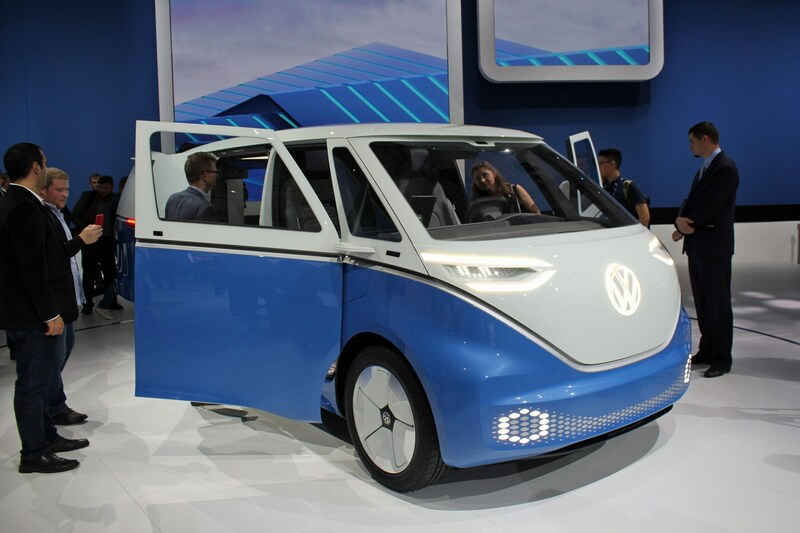 New for the van version is a solar panel on the roof, which feeds into the battery packs and is said to extend the driving range by up to 9 miles a day. Inductive wireless charging is planned for the production version. The ID Buzz Cargo is driven by an electric motor that produces 150kW of power – that’s equivalent to 204hp, matching the most powerful conventional Transporter engines of today. It’s rear-wheel drive, however, rather than front-wheel drive and requires only a single-speed transmission. Top speed is limited to 99mph. It rolls on 20-inch wheels – rather than the car variant’s 22-inch items – and you unlock it using a digital key stored on your smartphone. The front doors and the sliding side door are operated electrically. 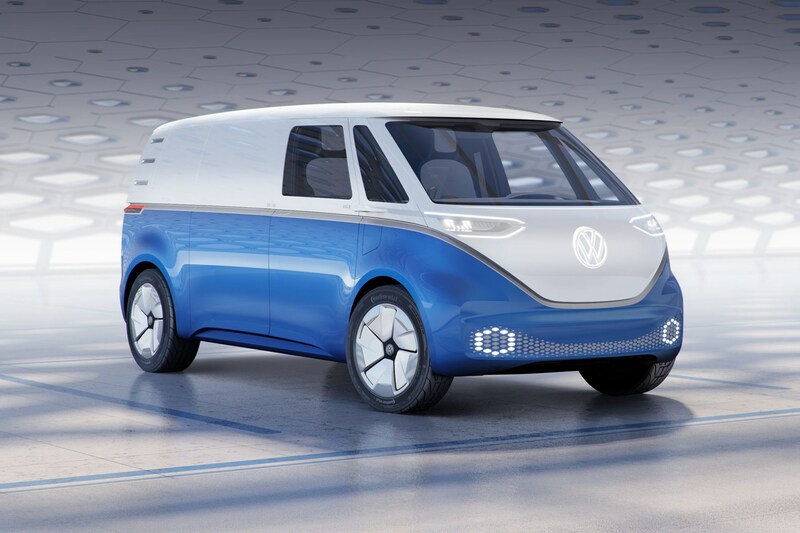 VW reckons the concept would have a payload capacity of 800kg. What’s an internet-connected load space? An extension of the ‘internet of things’. 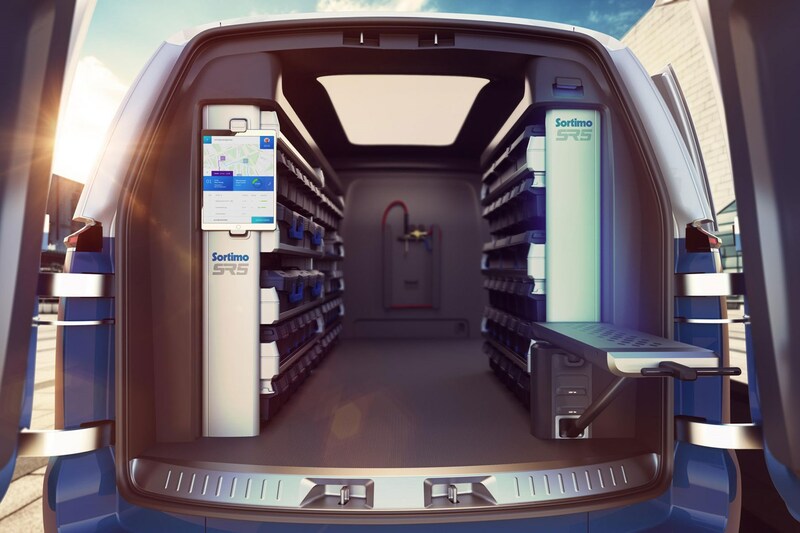 In trade use, this means all of the compartments in the Sortimo shelving system in the back of the ID Buzz Cargo concept are able to monitor their own stock levels, order replacement parts automatically, if desired, and perhaps even create invoices. A alternate variation of this would be a ‘pick-by-light’ system for parcel delivery drivers, which automatically illuminates the correct parcel when you arrive at the delivery address. A connected load space could also alert you to missing tools or safety items before you start driving. Sounds very convenient, if potentially complex to set up. What’s the ID Buzz Cargo concept like inside? Up front there’s a very minimalist dashboard, as most of the controls have been integrated into a tiny and very unusually shaped steering wheel, which is really just a giant touchpad that rotates. There's also a stand-alone portable tablet for other in-cab functions. Instead of rear-view mirrors, the Cargo has cameras that display what’s behind onto small, dedicated screens – tech that is already making its way into production in the latest Citroen Berlingo, Peugeot Partner and Vauxhall Combo. 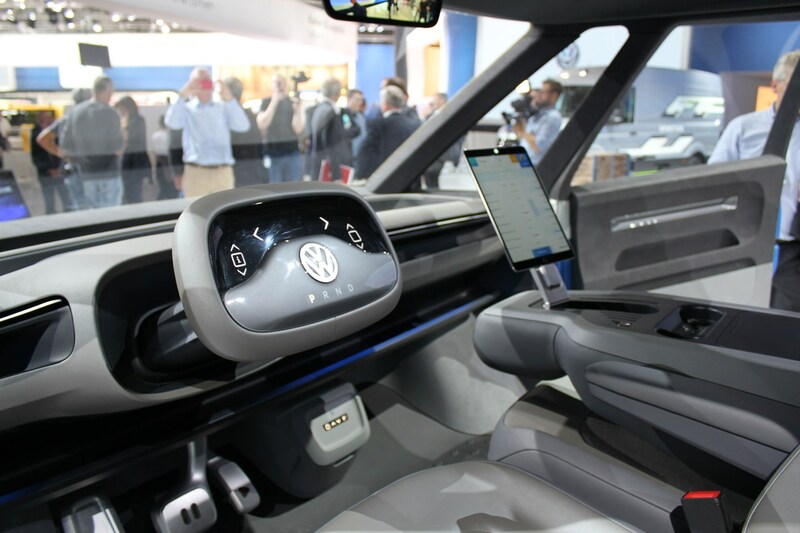 An augmented reality head-up display helps the driver keep their eyes on the road, while the dual passenger bench not only makes the ID Buzz Cargo a three-seater, it also doubles as a workplace with an integrated laptop. 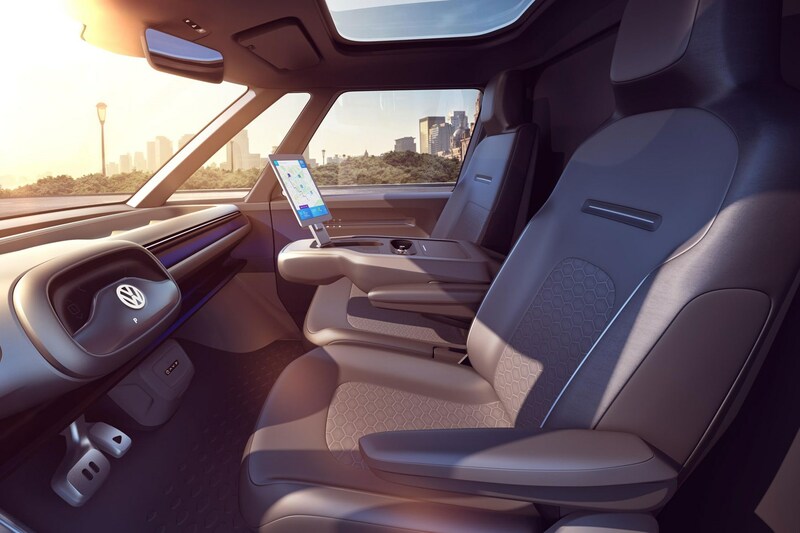 Since the van can also drive itself, the steering wheel can be retracted and the driver’s seat rotated 15 degrees, allowing the driver to make use of this workspace on the move. 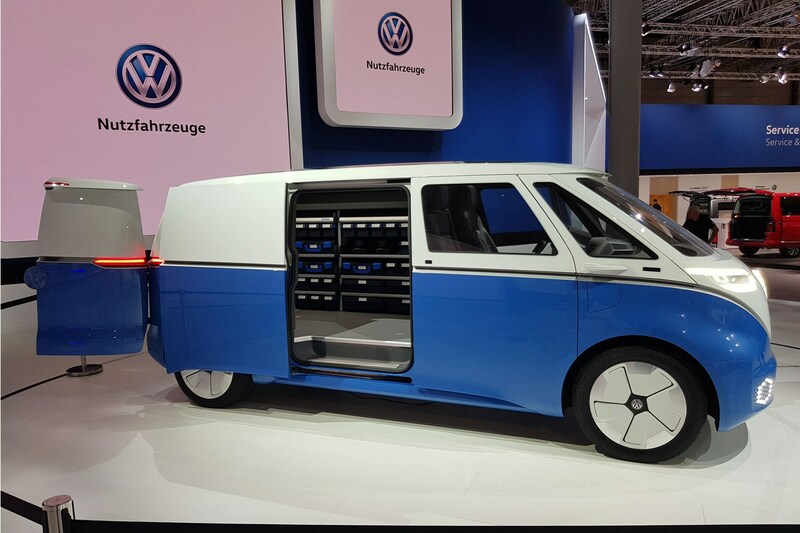 When does the VW ID Buzz Cargo go on sale?